has in fact been elevated to that of the perfect human being. Do these lofty opinions of Lincoln's character match the signs on his hand? 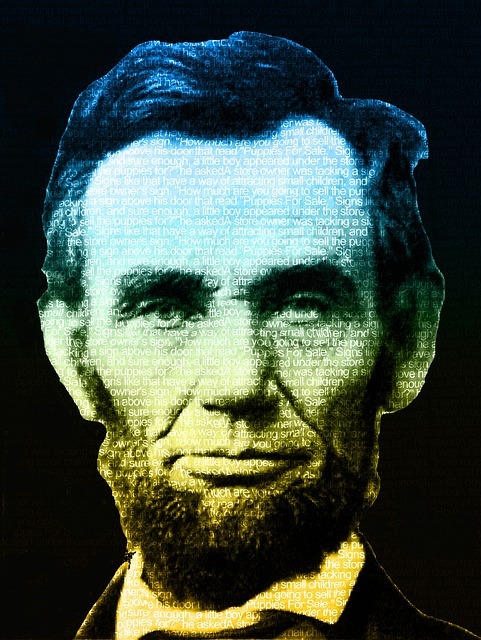 The adjectives used to describe Abe Lincoln make him appear to be flawless. He was known to be sincere, simple, persistent, modest, guileless, humble, loving, compassionate, warm, forgiving, generous, fair, responsible, helpful, thoughtful and non-materialistic. And he was an independent thinker who was also energetic, hard-working, realistic, straightforward, controlled, disciplined, cautious, ethical, intellectual and possessed integrity, wisdom and a sense of humour. If he had any faults at all it was his introversion and his melancholic and detached personality. One cannot help but wonder how a person can be loving and warm and also introverted and detached? Has Abe Lincoln's personality become the stuff of myth and legend now that he has been gone for over 150 years? There is a fairly decent impression of his hands is available here and that makes it easier to delve a little deep into Abraham Lincoln's persona. The photo used in this post is a free photo. Abe's hands have a long, fleshy palm and short fingers; the thumb is normally set and fairly long with a good balance of both the first and second phalanges. The mounts of Moon and Venus are prominent on his hand while the mount of Mercury is deficient. The headline is tied to the lifeline for a longish time and it is low-set as well. The heartline is long, deep and straight, going across the hand edge to edge. The fingers are mostly straight with the exception of the Jupiter finger and all fingers are of normal length, although the Mercury finger seems short. These signs show someone who is creative, energetic as well as simple, loving and non-materialistic, but yes, these are also the hands of a loner. The developed Venus mount, the heartline, the low-set Jupiter finger, the low-set headline and the thumb phalanges confirm his reasonableness, humility, compassion and a total lack of interest in material things. Yet, one cannot help but wonder how he could be detached and also warm and loving? This was probably because of his poor expressive ability and his inordinate shyness (almost crippling). His Mercury (pinky) finger, the length of its phalanges, the joint head and life lines, the closely held fingers, the heartline without branches and the dominant Moon mount – all of these signs show this if read in combination. Abraham Lincoln's hands show one clear defect in character ... he was a manipulative person. He planned his moves and rehearsed his words, more than anyone could ever guess. Aggression is not seen on his hand and often people who are timid use indirect means to get their way. On the other hand, while a manipulative nature can be a negative trait, it is not always so. It depends on the rest of the hand. Abrahman Lincoln's hands show that he was a warm, humble and compassionate person with zero interest in fame, status symbols, power or money. His manipulation of people and situations would be for the ultimate good. Planning came naturally to Abe as he was thoughtful to a fault. Oddly enough, while Abe was a great planner, he wasn't wily, and would be unable to tell a white lie. However, Abraham Lincoln was the kind of person who would find it difficult to reveal his true self. He would likely say and do things to please others and would try to avoid confrontation. All in all, his hand confirms his noble character. Such a person would not be able to succeed in politics in the 21st century – qualities like humility and shyness would get in the way. Today, it is charisma, big promises and an extroverted personality that people look for in their elected leaders. The difference between the 16th President of the United States (Abe) who guided America through a bloody civil war and Donald Trump, the 45th President of the United States is telling. Related Reading: Martin Luther King Jr, the hand reading of Hillary Clinton or a comparison of Hillary Clinton and Obama. WOW! Great ma'am! This was such an awesome option to read for. "All in all, his hand confirms his noble character. Such a person would not be able to succeed in politics in the 21st century – qualities like humility and shyness would get in the way. Today, it is charisma, big promises and an extroverted personality that people look for in their elected leaders. The difference between the 16th President of the United States (Abe) who guided America through a bloody civil war and Donald Trump, the 45th President of the United States is telling." Very well written, Nita. And I couldn't agree more.